We’ve added Paypal Payflow to our list of supported payment gateways along with Authorize.net, Square, Stripe, Braintree, and Paypal as the payment options available. 1. Enable ‘Payflow’ from Settings –> Add Ons –> Enable Payments through Credit Card. 2. 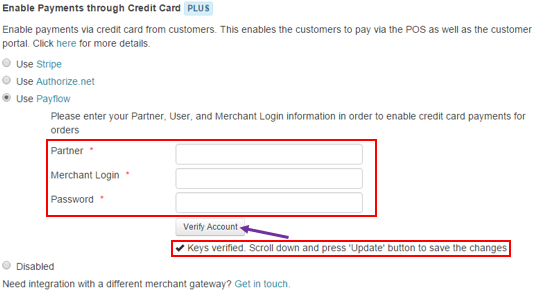 Enter your Payflow account credentials (Partner, Merchant Login and Password) and click on ‘Verify Account’. If it’s successful, a notification will show up saying, ‘Keys verified. Note: To save changes and enable Payflow, you must scroll to the bottom of the ‘Add Ons’ page and press ‘Update’. 3. Now, log in to your Payflow account (via PayPal Manager) and head to the ‘Account Administration’ section. Go to ‘Transaction Settings’. 4. From Transaction Settings, enable ‘Reference transactions’ and press ‘confirm’. 5. Head to ‘Allowed IP Addresses for API’ transaction processing under the Account Administration section. Once the values are entered, click ‘Update’. That’s it, you are done! With Payflow set up, you now have a POS (Point of Sale) ready for Credit Cards transactions. Email at info@ezrentout.com or write to us at support@ezrentout.com. You can also join us on Twitter @ezrentout. Join us on Facebook and become a part of the conversations on there. Check out our blog for more in depth feature posts on our equipment rental software. This entry was posted in [Support], Integration, productivity and tagged integration, paypal payflow, POS by admin. Bookmark the permalink.